Senator Christopher J. Connors was born in Ridgewood, New Jersey on June 26, 1956. He graduated from Southern Regional High School and attended Stockton State College, where he graduated with honors in 1978 with a Bachelor of Science degree in Business Administration. He earned a Masters Degree in Public Administration from Rutgers University Graduate School of Public Administration in Newark in 1988. 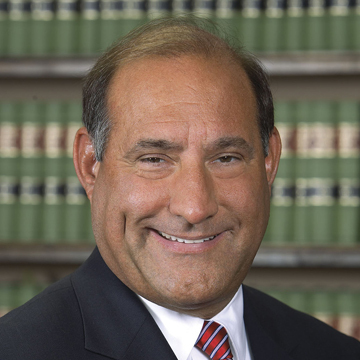 Senator Connors received a Juris Doctor Degree from Rutgers University School of Law at Camden in 1995 and was the recipient of the American Bar Association’s Award for Excellence in Municipal Law. He was elected to the Lacey Township Committee in 1984 and served as Mayor from 1986 to 1990. He was the Republican Municipal Chairman from 1986 to 1990. He served on the Republican County Committee in 1984 and 1985. From 1982 to 1988, Senator Connors was Deputy Director of the New Jersey Commission on Capital Budgeting and Planning and served as its Director during 1988 and 1989. The Commission is responsible for the preparation of the annual capital budget for the State of New Jersey, coordinating the long-range capital expenditure plans for the State, evaluating and analyzing capital requests for all Departments, monitoring capital spending of all State Agencies and evaluating the impact of capital spending on future State budgets. Senator Connors was selected by the Republican County Committee members and was sworn to the General Assembly on September 28, 1989. He was elected to his first full term in the Assembly in November, 1989, and was reelected in 1991, 1993, 1995, 1997, 1999, 2001, 2003 and 2005. He was elected to the Senate in 2007 and was reelected in 2011 and 2013. While serving in the Assembly, he was the ranking member of both the Assembly Judiciary and Homeland Security and State Preparedness Committees. He served as Assistant Majority Leader from 1992 to 1995. Senator Connors is currently a member of the Senate Community and Urban Affairs Committee and the Senate Military and Veterans’ Affairs Committee. He received the 1996 Public Service Award from the Ladies Auxiliary of the Retired Police and Firemen’s Association of Ocean County Local No. 8, was named Honorary Lifetime Member of the Ladies Auxiliary of the Retired Police and Firemen’s Association of Ocean County Local No. 8, was named 1999 “Citizen of the Year” by the Bayville Veterans of Foreign Wars Post 9503, was named 2000 Legislator of the Year by VFW Post 6063, received the 2000 Distinguished Service Award from the State VFW Commander, received the Legislative Achievement Award for 2001 from the State Retired Police and Firemen’s Association, served as the Legislator-In-Residence at Richard Stockton College for the Spring 2012 Semester, was named “Legislator of the Year” by the Veterans of Foreign Wars of the United States Department of New Jersey for 2012, received the 2013 Robert B. Meyner Award from the New Jersey State Bar Association (NJSBA), was the recipient of the New Jersey Conference of Mayors “Legislator of the Year” award in 2013, was selected as a honoree by the Business and Professional Women of New Jersey Foundation (BFWNJ) Southern Ocean County organization during its 16th Annual “Women Helping Women” Award Dinner and was named “Legislator of the Year” by the New Jersey Apartment Association (NJAA) in 2014. Senator Connors is an attorney with the law firm of Dasti, Murphy, McGuckin, Ulaky, Koutsouris & Connors. The Senator and his wife, Deborah, were married in 1979. They have two children, Christopher, Jr., born in 1982 and Kelly, born in 1987.